Bento, the database application for Mac OS X, was updated to version 3 Tuesday, bringing new features, security options, integration with iPhoto, and more. The latest version from FileMaker, which is a subsidiary of Apple, is now available for purchase, with the company calling the product a "breakthrough." For the first time, Bento integrates with iPhoto, allowing users to store information about photos and link them with contacts, projects, events, and other information within the software. "Think of Bento 3 as a powerful, easy way to bring together all of your key Mac information and photos," said Ryan Rosenberg, vice president, marketing and services, FileMaker, Inc. "With Bento 3, were providing new ways for you to view and interact with your information so you can organize contacts, projects, events and even more details of your life." 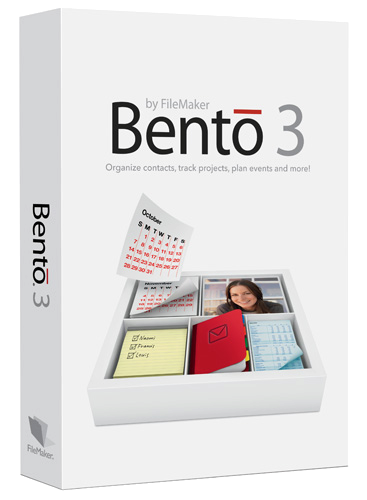 Bento 3 costs $49 for a single license, or $99 for a five-license family pack. Users of Bento 1 or 2 can receive a $20 rebate for the upgrade. In addition, those who bought Bento 2 after Aug. 30 are qualified for a free upgrade. However, Apple authorized reseller MacMall is offering the single license version for $43.99 and the family pack for $89.99. The $20 rebate also applies. Bento was released by the Apple software subsidiary FileMaker, Inc., in 2007. It is a multipurpose application designed for organizing information from a variety of sources. Version 2 debuted in late 2008. See all your albums listed in the Bento Libraries pane automatically - no importing required. View any library in the new Grid view to show a grid of images or thumbnail views of your forms. Create and view your own customized thumbnail forms. For example, say you have 40 products that you're selling. You could create a form where you have an image of the product next to the part number and price to see multiple product cards together on one screen. See thumbnail images of a media in your Related data fields (formerly called the Related records list). For example, you can link a list of guests to an event - and see a picture of each person. Additional features are detailed at the official Web site. A free 30-day trial is also available.